After a bad storm, we lost power and it wasn't predicted to come back on for 24 hours. I thought this would be a good opportunity to use my 2013 Leaf as a giant battery pack. I bought a 750W inverter https://mechanicguides.com/best-power-inverter/ , which should have been big enough to power my 5.1A fridge, but it wasn't able to power it. It did come on, the lights worked, the temperature readings worked, and if i turned off the cooling the fans would run. But not the compressor. I returned the 750W and bought the largest they had which was 1000W (2000W for 0.1 seconds) and it still wasn't able to run the refrigerator. Both were able to power a small 1A refrigerator. Luckily, the power came back on after 18ish hours, but I hope to learn what the correct solution is for next time. Any ideas? The 750W inverter never reported over current. The 1000W doesn't have any way to report that. I assume there is a large inrush when starting the motor, but not sure how I can easily measure it to know what size inverter I would need. I also thought about it later and the fridge must be sensing and not trying to turn on the compressor for some reason, since the rest of it worked fine. Last edited by Teronuc on Tue Jan 08, 2019 4:07 am, edited 1 time in total. i don't know the current limit of the leeaf dc-dc converter that supplies the 12VDC from the main pack, but if it were 80 Amps, then the max power you could draw (assuming sufficient sized wiring) is 960 W.
The inrush current for a frig compressor was measured and found to be ~13 Amps for 0.1 sec, and it takes about 0.5 sec to get up to speed, so that probably exceeds the ability of the 1000W inverter. Fluke makes an outlet line adapter that will let you measure the current from the wall with a multimeter, but it's limited by the fuse within the DMM. So another approach is to just size the inverter for the size of the circuit breaker that the refrigerator using. e.g. if 15A breaker, then 1800 W; if 20A, then 2400 W.
During our power outages I've used many options, most of them using my 48vdc lithium or lead battery packs; however, I've also used my i-MiEV as a quick fix as I have permanently-mounted Anderson connectors for the 12v under the hood. Be sure the car is in READY for the dc-dc to remain active. Agree with kiev, first measure the current draw by your fridge, especially its inrush current. A few years ago I was pleasantly surprised to discover that my 5-year-old fairly large home fridge only draws 110W (with about a 50% duty cycle). maximum voltage to the fridge. 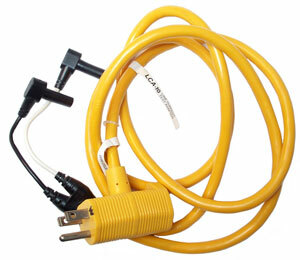 and for a 10 ga cord it would be 117V. Our Dewalt DXAEP1000 1000w inverter is rated for a 2000w surge. It will start and run a fifteen year old fridge, and I can then plug in our chest freezer as well. Very handy when the outer bands of hurricane winds knock out power in our rural area. Power vehicle is a 1982 Toyota Diesel pickup with two 12V AGM batteries. was around 1150w at startup, according to the meter on the inverter. It would be nice to have a 240V inverter directly(and safely) connected in to an EV high voltage battery pack! That could be enough to run our well pump. We recently lost power for 72 hrs due to a huge windstorm on Vancouver Island. On the second day I ran out and bought a 500 W inverter (1000 W peak) and powered our fridge and a few lights for the remainder of the outage. The inverter did shut down a few times I assume b/c the load was too high when the fridge compressor kicked on. I have since picked up a 2000W inverter to use next time. To my great amusement I also powered the fan on our propane fireplace as well as its the only non-electric heat in my house. Teronuc + others, this is interesting. I dream to use my C Zero to power up a “tech unit” with a fridge, heat pump, water heater and 12v outlets for a small off grid cabin I am designing. I wondered how to tap into the battery pack, but reading this thread i understand you can simply insert an outlet under the hood and connect it to the wires to and from the 12v battery? Does that mean the main batteries will send power to my external circuit in the same way it sends current to charge the 12v battery? (Provided the car is in Ready mode). CZero - Whoa! You need to do the math. Any energy being removed from the 12v battery will be replaced by the dc-dc converter from the i-MiEV traction pack. For example, a 150W output from the inverter means about 16A out of the 12v battery which means that the i-MiEV dc-dc needs to supply this current. (150W/12v)/0.8 = ~16A, where I simply guess that the inverter is 80% efficient. I personally would not try to draw much more than this from the i-MiEV, even though our dc-dc is rated significantly higher. I am inclined to not stress our OBC/dc-dc module at all. While 150W is sufficient to power some LED lights and maybe a small refrigerator, forget about running a heat pump or water heater (just look at their specifications). If you are designing an off-grid cabin, why not utilize solar panels, a small windgen, or small hydro if you have a stream nearby, with perhaps a 48v battery bank instead of a 12v battery bank? Hey, rather than the i-MiEV supplying power to your cabin, instead perhaps the cabin can then also recharge the i-MiEV? The sensible thing would be what you suggest; a fixed batteri powered by solar panels. When, for those grey winter days a backup plugin into the car to draw some LEDs and not much more. I just found out a company offers a product called an EV Power Station: http://www.nichicon.co.jp/english/new/new135.html. Apparently it allows us to draw power directly from the battery pack, and not from the 12V circuit. I am going to look into this further to see if it is an option for me. Does anyone know about this product? There is a reasonable chance that Nichicon know a thing or two about iMievs [ edit: at least the charrgers and batteries ] , since their name appears on the OBC printed circuit boards, as well as the electrolytic capacitors. Of course, that means they're also pretty much responsible for the high percentage of charger failures, so perhaps take that into account as well.